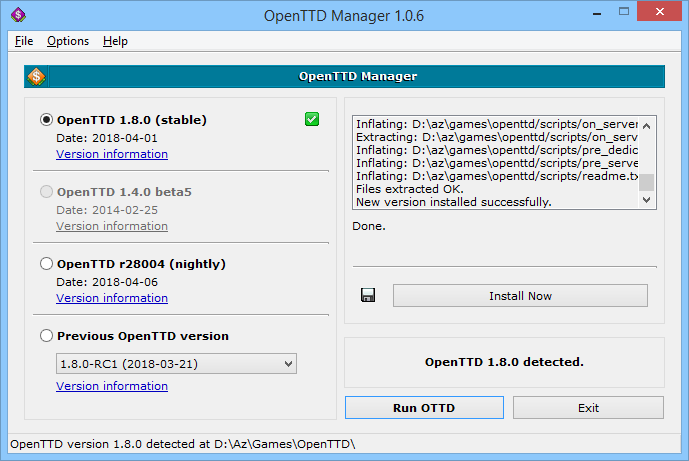 OpenTTD Manager is a freeware program that allows the user to check for OpenTTD version updates and change versions fast and easily. OpenTTD is an open-source recreation of the simulation game Transport Tycoon Deluxe that greatly improves many aspects of the original game. To add a new language, download this file or go to Options > Settings, click the plus sign next to the language list, and follow the instructions from the generated language file to translate it and send it to the author for the next version. To complete an existing translation, go to Options > Settings, select the incomplete language, and click the Complete this translation link, then follow the instructions from the generated language file. You don’t need to separately download OpenTTD to get started, simply download the program, click Check for Updates, and then use the Install button to download OpenTTD to your desired location automatically. This entry was posted in Visual Basic 6 Apps and tagged ttd on December 6, 2014 by Andrés Zsögön.